Getting people to sign up for your email newsletter is only half the battle. Actually getting your emails into their inboxes is the other half. There are plenty of best practices for ensuring email delivery. One of the easiest is simply asking the email recipient to add your email address to their contacts list. Most email clients will “white list” emails coming from email addresses included in the recipient’s contact list. I was recently introduced to Drop Box , an online service which allows you to share data between devices seamlessly. In keeping with their simple product, their website is amazingly intelligent and simple. 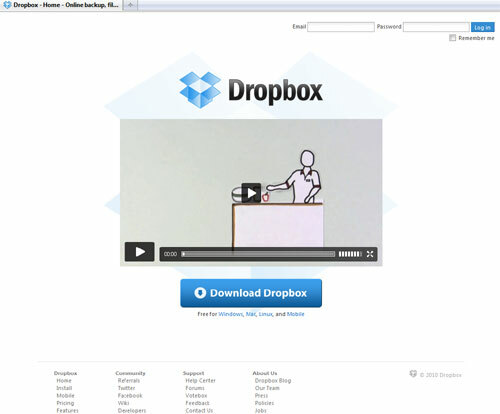 A clever video describes in detail how DropBox makes the user’s life easy. And a large download button drives conversions. Really all it is lacking is a tag line that accurately speaks to the purpose and value proposition of Drop Box (“Easily Share Data Between All Your Devices”, maybe?) and some text for search engine optimization. Creating a simplified download page is critical to minimizing site leakage and abandonment. While DropBox doesn’t hit a home run on all best practices, it does exemplify some of them. Keep the download page simple. Simple simple simple. Make sure that the download page is compatible with all major browser types. Utilize geo-locational technologies to deliver local language versions of your download page. Don’t make it difficult to actually download the software. Create a large clickable area around the “download now” button. Prepare for the worst. If someone has trouble downloading the software, what are you going to do ? Give users step by step installation instructions during the download. Don’t forget to customize those instructions based upon the user’s browser type! Include web analytics code to track not only how many people visit the download page and where those downloads are being referred from, but also how many people are actually installing the software. Capture user information before the download … so that you can start marketing to the user often and frequently. TrialPay, the alternative payment engine we’ve discussed in the past, has recently launched TrialPay E-Commerce, an online store. The twist with TrialPay’s online store offers 0% payment processing. They can do this by offering customers the ability to get a discount on their purchases from your store, simply by taking another offer (a familiar model for those of you who understand the alternative payment options). This is a smart move by TrialPay. Until now, their service worked best with clients who ran their own online stores. With TrialPay E-Commerce, TrialPay makes their service available to a wide array of smaller online stores, and offers them a unique revenue model which in some cases can result in higher per cart sales versus traditional online store methods. Here’s a great example of an upsell email. 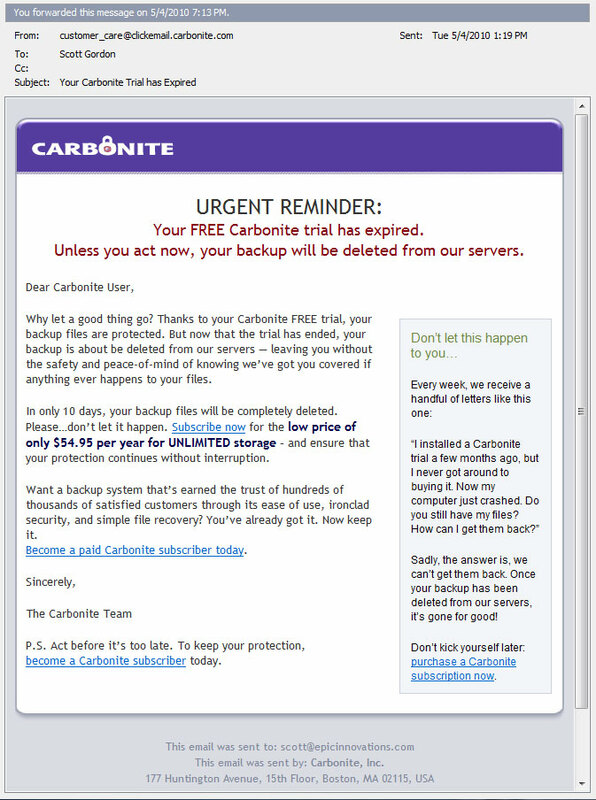 With my Carbonite subscription about to expire, I have received the following email. The subject line: “My Carbonite Trial has Expired”. Notice the initial capitalization, and the compelling call to action. Personalization: Well, they haven’t personalized this. It should read something like “Dear Scott”. Fear, Uncertainty, Doubt: “Your backup will be deleted from our servers”, “Don’t let this happen to you”, “In only 10 days, your backup files will be completely deleted”. Testimonials. In this case, they are from people who didn’t take advantage of Carbonite. These are just a few of the best practices that you can incorporate into your email marketing to increase upsell conversions. Ever wonder why some web page sales pitches go on and on and on? A seemingly endless page with countless “buy now” buttons. The answer is simple: because they work. But just creating a long web page isn’t the magic bullet for sales conversions. This case study about SEOMOZ shows the basic elements to creating and testing a web page that converts. The case study notes that you need to create a web page long enough to tell the story. Imagine that you’re speaking directly to the reader. How would you convey your message? What value propositions would you deliver? How do you create curiosity? How would you make them convert? As most of you know, for the past month or so I’ve been actively discussing FTC ruling 255. FTC ruling 255 requires people, including bloggers, to disclose when they receive consideration for promoting products and services. It is interesting to see that others are picking up on the risks and liabilities related to this ruling. 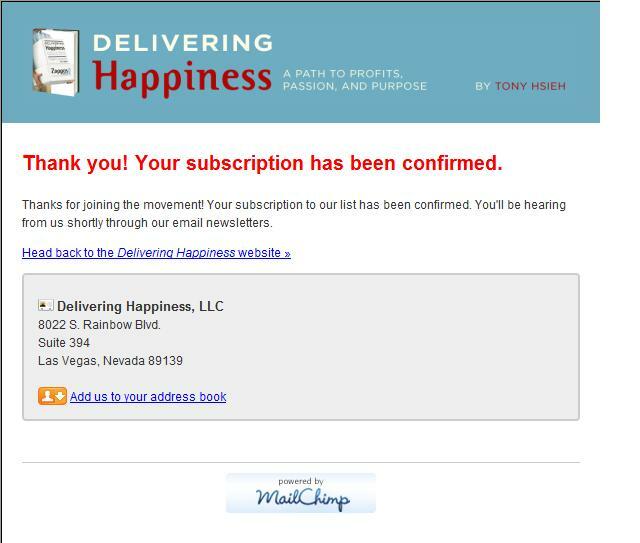 I received an email from the Zappos team today, reminding me (and the other bloggers) that we need to disclose that we have received consideration (in the form of a free book). FTC ruling is clearly going to have long term implications on blogging. I remember flying just after 9/11, and how grateful the flight crew was. They thanked us profusely for flying their airline, especially in those turbulent times. Compare that to my most recent flight, where all we heard was a flat “thanks”. How quickly we forget about celebrating the customer. Since my first job, I’ve always know the importance and value of customer service. This has become even more apparent as I’ve been reading “Delivering Happiness”. Often we hear that “all it takes is a simple thank you”. I disagree. It takes more than a simple thank you. It takes a sincere and proactive effort to celebrate the customer. It shouldn’t take the threat of losing your job to make you want to deliver an amazing customer experience. It isn’t hard. Under promise. Over deliver. Always leave your customer happy, feeling that they received value for their money.